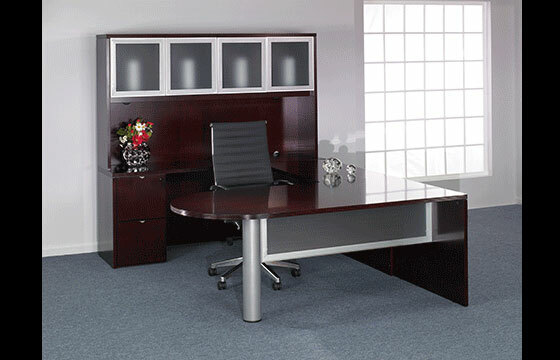 This beautiful Mahogany U Shape has a bullet desk with a frosted glass modesty. Also pictured is a file/file ped and an overhead hutch with matching frosted glass doors. All models in this series features select hardwood veneers crafted in traditional fashion and comes available in Mahogany or a Light-Cherry. The modular design allows for quick and easy changes or reconfigurations for a long-term flexibility.